On 14 July 2015, we are holding a Charity Dinner at the Honourable Artillery Company (HAC) in the City of London EC1 2BQ. This will be the first SUPPORT OUR PARAS major fund raising event for 2015. A similar event held at the HAC in 2014 in support of the Afghanistan Trust was attended by City bankers, lawyers, accountants, consultants and business men, among others. This year’s Dinner will be the first under the banner of the SUPPORT OUR PARAS charity. We hope the evening will be a celebration of the achievements that have been made with your support. It is only with your help that we have been able to provide assistance to those who need it. SUPPORT OUR PARAS is a registered charity (1131977) which supports The Parachute Regiment through the welfare of serving soldiers, their families, those affected by recent operations and through the maintenance of its regimental efficiency, ethos, spirt and heritage. 1830-1950 – Champagne drinks reception on the HAC forecourt. 1830 – Static displays of Para equipment, vehicles and troops. 1920 – Free Fall Display of The Parachute Regiment’s Red Devils. 1930 – The Band of The Parachute Regiment. 1950 – Guests are escorted to the dining room by Para table hosts. 2000 – Para Colour Parties march into the dining room & post the Regimental Colours. 2000 – Dinner (each table hosted by a member of the Parachute Regiment). 2150-2200 – Guest speaker Martin Hewitt. Wounded in Afghanistan, disabling his right arm, former PARA officer Martin has since trekked to the North Pole, competed in Army ski teams and led an Everest expedition. He will tell his inspiring story. 2200-2300 – Auction of major items by Mr Russ Williams (a popular professional auctioneer). Auction Lots -To be confirmed. There will also be two silent auctions. 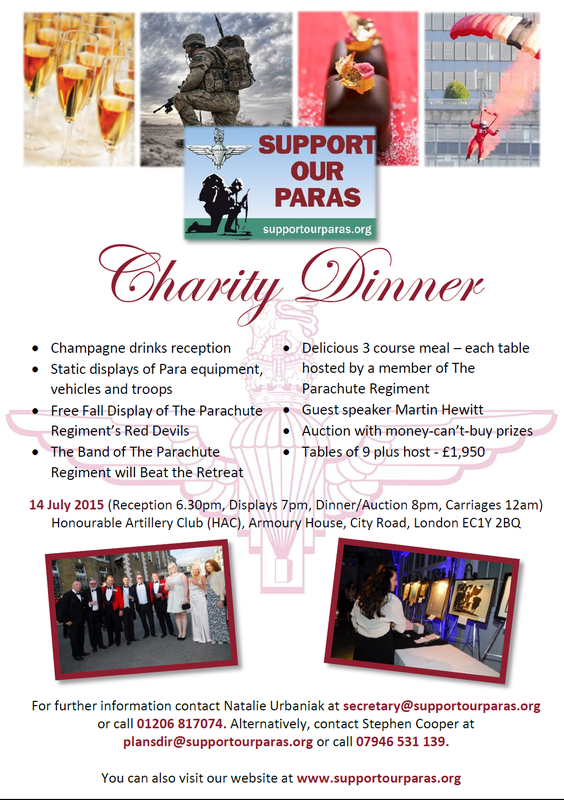 Please note that all proceeds from the evening will go direct to the SUPPORT OUR PARAS charity. 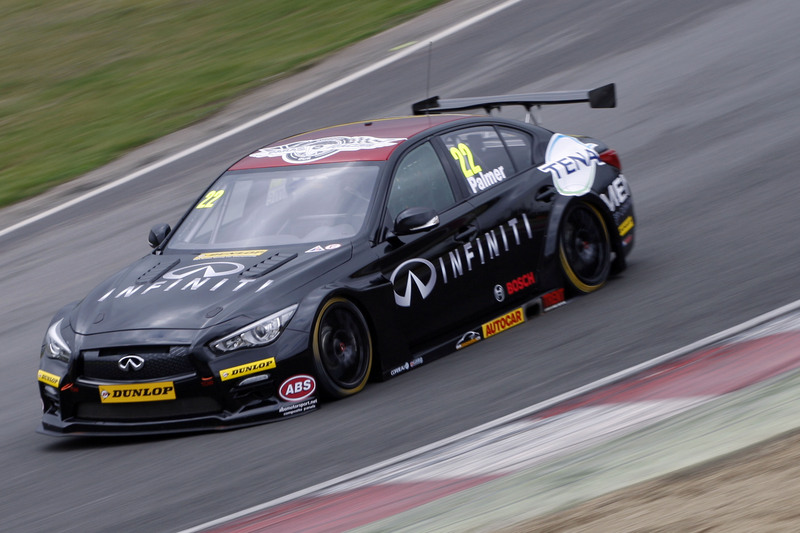 Infiniti Support Our Paras Racing began its march to success in the Dunlop British Touring Car Championship when it delivered an impressive opening weekend. And just four days after the car completed its first test at the team’s Mallory Park HQ in Leicestershire, it exceeded the goals it had set itself for the first triple-header at Brands Hatch. Derek Palmer, the 28-year-old Scot, was charged with driving the team’s first car at the Kent circuit: the second will debut at the next round at Donington Park on April 18/19 in the hands of Richard Hawken. 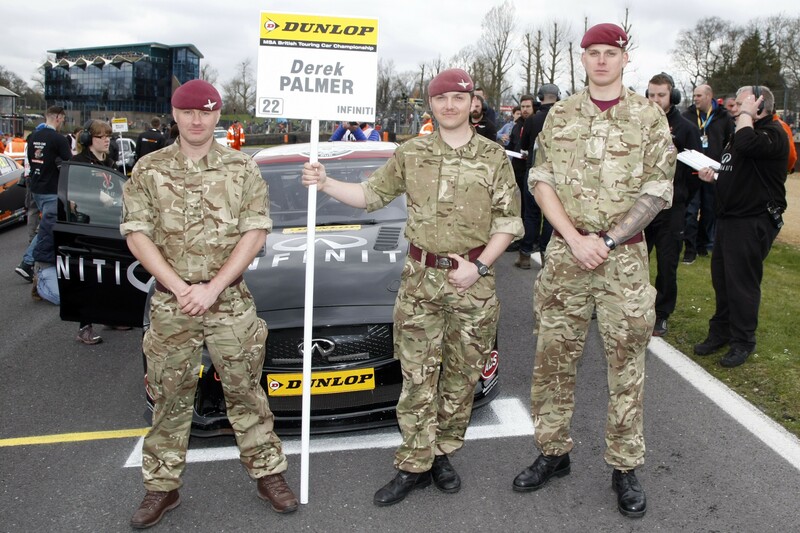 Supported by a number of serving members of the Parachute Regiment, Palmer overcame an early power steering problem to bag two top 20 finishes. “We’ve exceeded our expectations this weekend,” Palmer stated as he thanked the Paras who had worked tirelessly to prepare his race car. “No one should underestimate the achievement the Paras have delivered. 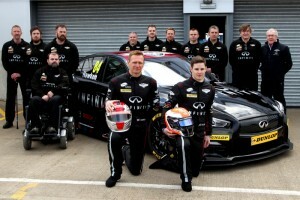 These are guys who were injured serving our country, and in the space of a few months have built a BTCC racer capable of competing successfully in Britain’s top championship. 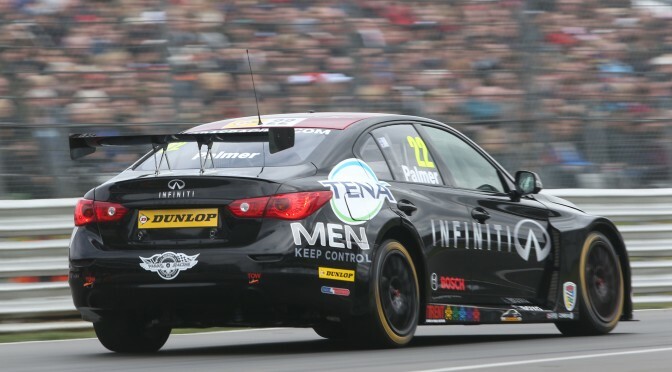 And Palmer’s performance — finishing 20th in Race 2, before improving to 18th in the day’s finale — was praised by ex-Para, Team Leader Darren Fuller. “For all injured Paras who form part of the team, the weekend’s been absolutely fantastic,” Fuller, a former Colour Sergeant in the Parachute Regiment who lost his right arm serving in Afghanistan 2008, explained. 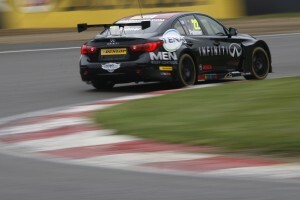 “It’s been a massive achievement just to get here with one car to race in the ultra-competitive BTCC. And we’ll certainly have the second car on the grid in a fortnight at Donington. “The lads are doing it for the charity and what we actually want to do is raise awareness and funds for that charity, and today was the first step towards achieving that. 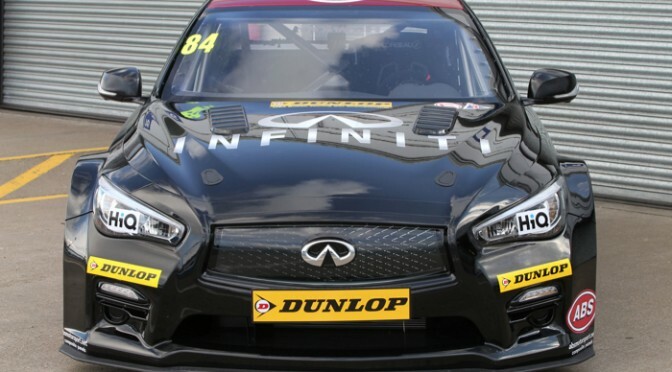 Premium car manufacturer Infiniti, in partnership with Support Our Paras Racing, will contest this season’s Dunlop MSA British Touring Car Championship. 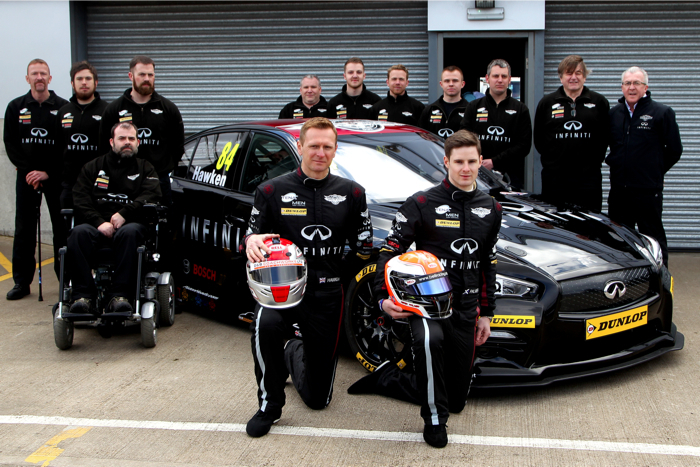 The team, known as ‘Infiniti Support Our Paras Racing’, starts its campaign in the first triple-header at Brands Hatch this weekend (April 4/5). And the team was centre of attention at the official BTCC Media Day at Donington Park, the traditional event which heralds the start of the new season. 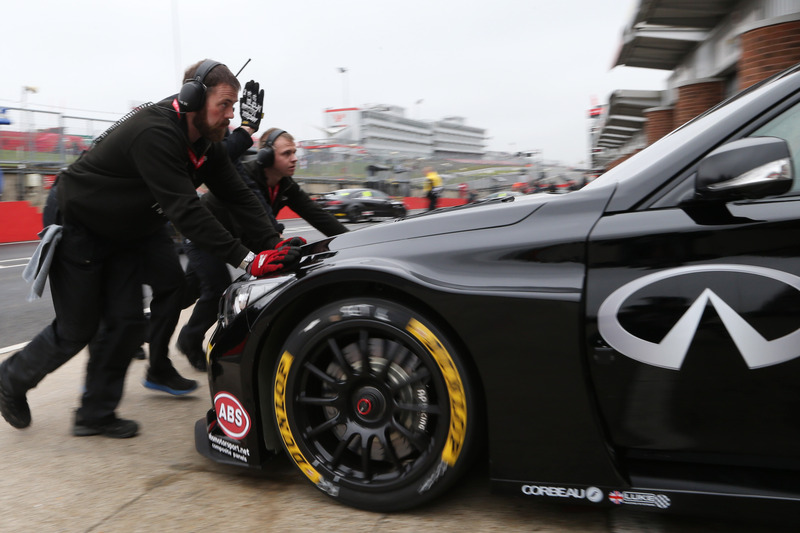 The team, overseen by Team Principal Derek Palmer, consists of a number of injured Paratroopers who will work on the cars to prepare them not only for race weekends, but also maintain their maximum efficiency throughout the hectic schedule of a BTCC season. Two injured ex-Paratroopers have already been employed by the team, with an additional five injured ex-Paratroopers employed on a part-time basis. 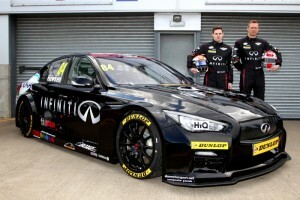 The two NGTC Infiniti Q50 race cars will be driven by Richard Hawken (Walton on Thames) — who has won three championships at club level — and Derek Palmer Jnr (Lanark/Zurich). Both drivers have raced successfully in Super Touring Cars in recent years. Hawken too is delighted to be making the step into Britain’s biggest and most high-profile motorsport championship, the BTCC — which consists of 10 race meetings at the UK’s leading circuits, and 30 races — with Infiniti Support Our Paras Racing. Fundraising for the Armed Forces in the United Kingdom has dropped down 30-40% in the last two years because of the drawdown in Afghanistan. But the problem doesn’t go away. The Parachute Regiment lost 26 soldiers during the campaign in Afghanistan, with more than 130 others wounded. The charity also looks after the families of the wounded and those who have lost their loved ones. The team is operating out of a newly-refurbished HQ at Mallory Park. The Leicestershire race circuit started life as Royal Air Force Station Kirkby Mallory, a standby landing ground during WWII before closing in 1947. 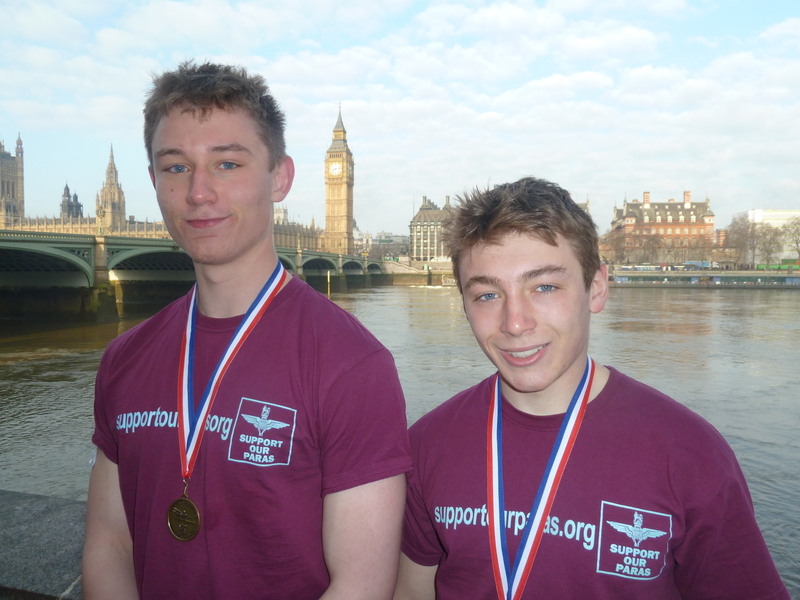 UPDATE: We want to say a HUGE thank you to Hamish Lorimer and Henry Anthony who have raised over £2,000 for SUPPORT OUR PARAS. 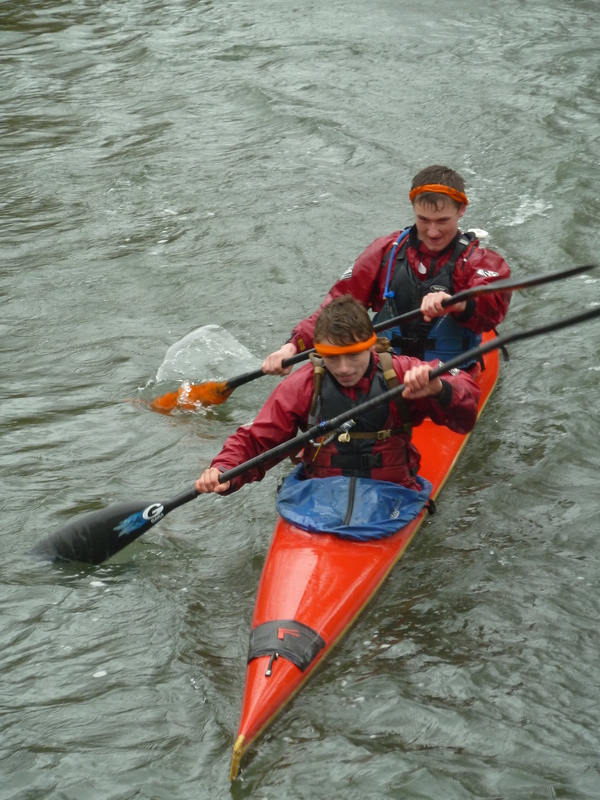 Despite suffering from hypothermia, a broken seat, illness and lots of aches and pains, they battled on to complete the Devizes to Westminster International Canoe Race in a time of 21hours 40minutes. This placed them 24th out of 80 in their Junior Doubles category. They were also the fastest team that was entered from their school, which is a brilliant achievement considering they were a novice crew racing against many schools and clubs who do it as their full time sport. An impressive run and a great effort from these two 17 year olds. 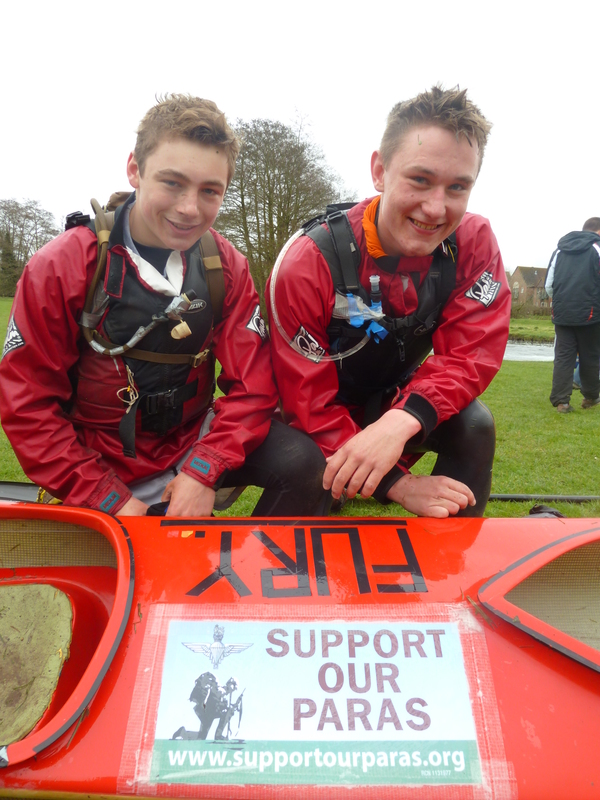 This Easter, Hamish Lorimer and Henry Anthony will be taking part in the Devizes to Westminster International Canoe Race (DWICR) to raise money for SUPPORT OUR PARAS. The DWICR is over four days and starts in Devizes, Wiltshire, finishing just downstream of Westminster Bridge in Central London, opposite the Houses of Parliament. This race has been held annually over the Easter Weekend since 1948. The two 17 year olds will start the race on 3rd April, paddling about 35 miles for each of the first 3 days and camping overnight. Then, with just 17 miles left, they plan on leaving in the early hours of 6th April to reach Westminster for breakfast. The race is a severe test of skill, stamina and planning and Hamish and Henry have been training hard. We wish these two aspiring Paratroopers all the very best, and extend our thanks for choosing to raise money for SUPPORT OUR PARAS. 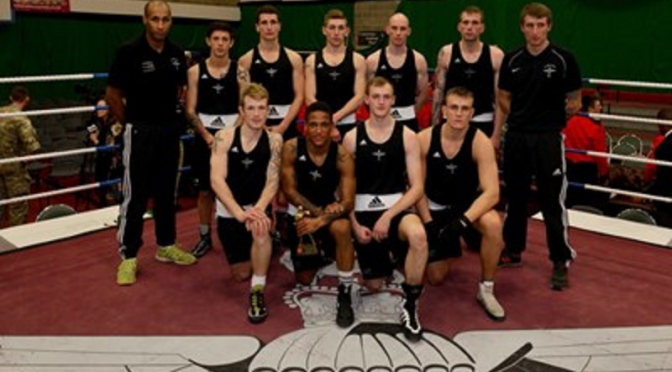 The 3 PARA boxing team are currently in North Carolina preparing to take on the United States’ 82nd Airborne Division in the boxing ring. The event will take place at the end of the CJOAX and will mark the end of the exercise and the ongoing joint operability between the 82nd Airborne and 16 Air Assault Brigade. The 3 PARA team is preparing to preserve their undefeated title in front of 3,500 spectators at Fort Bragg on Wednesday 22 April 2015 and will be shown on Forces TV from midnight. Tune in to Sky Channel 264, Virgin Channel 244 or Freesat Channel 652 to catch a piece of the action. CO 3 PARA intends to have the Battalion Boxing Team box a Team from the 82nd Airborne Division at Fort Bragg, North Carolina on 22 Apr 15. The event will take place at the end of the CJOAX and will mark the end of the exercise and the ongoing joint operability between the 82nd Airborne and ourselves; more importantly it will be used to commemorate the end of our operations in Afghanistan. The event has been talked about and indeed planned previously but we are now confirming that it will take place and the 82nd Airborne are enthusiastic about the importance of this event. We have managed to get Sgt Jackson who was wounded in action out to visit this event courtesy of SUPPORT OUR PARAS and would look to raise the profile of the charity through this event. It is appreciated that getting to this event will be very difficult, not only by the geography, but in getting onto the base at Fort Bragg. However, if there are people who wish to donate and attend, then we may be able to get them onto the base. Clearly the cost of travel and accommodation would be down to the individual. This Boxing Event is a significant milestone which marks the end of one era of operations and looks forward to the next chapter in our ‘special relationship’ with the 82nd Airborne Division. To end the CJOAX with this boxing match will be the culmination of over 12 months of joint inter-operability focus which paves the way for interoperability in the future. We have history behind us and a superb way forward with the US Army. This event will be an excellent opportunity to recognise those who have sacrificed so much and to ensure they feel valued as part of our Battalion and indeed the Regiment. Your support in raising funds for SUPPORT OUR PARAS is greatly appreciated.